I often evangelize the importance of first time user experiences. After all, not all of the users acquired to a product will stick around, but they’ll all experience its first run design. To encourage return use, that first impression must be solid. But it’s also very common for designers to overemphasize the first run experience at the expense of long-term user support. It’s not difficult to see why the first run would be a tempting focal point for product teams. It’s a clearly defined user scenario. It’s often easier to detect first entry than it is to track nuanced behaviors of intermediate users. And it provides “dedicated real estate” that all users see, a canvas upon which we paint the stories of our features and designs. If we focus on the first run experience, it becomes a one-off feature for our release notes instead of an experience that guides over time. To put this problem in perspective, let’s consider where the word “onboarding” came from: the Human Resources industry. When I landed my first tech job, I was so excited. On my first day, I arrived at the office of my new employer 45 minutes earlier than the scheduled orientation session and watched my future colleagues trickle in. I dreamed about what kind training program they had in store. Eventually a woman from HR escorted me to a windowless meeting room. It was just the two of us. She explained that my manager was out of the office and that she’d be handling my onboarding. I spent the next several hours filling out a bunch of NDAs, tax forms, and other standard paperwork, while half-listening to lectures about the office’s projects and protocols. It was a lot of information. At noon my HR chaperone announced that we were done, escorted me to my desk, and told me that my colleagues would introduce themselves when they returned from lunch. I sifted through the employee handbook I’d been given but found nothing about what I should do next. So waited for my coworkers. They must have some next steps for me. A starter project? An introduction to the intranet? Shadowing them at meetings? But as the day wore on, as the weeks wore on, I realized that no one had planned anything more to help me get started beyond introducing themselves. That first half-day was the extent of this company’s onboarding program. I left this company not too long after this experience, surviving a few months longer that I should have thanks to a fellow designer that donated personal time on weekends to give me the lowdown on key projects. Think back to when you first joined a new company. Did you establish a working rhythm in one day? Were you an expert on company culture at the end of orientation? If you’re a manager, would you say that your new hires are fully performing at a good clip right after they join? While orientation is what most people think of when starting a new job, it’s really a single event in an onboarding continuum, often one comprised of logistics irrelevant to day-to-day routines. 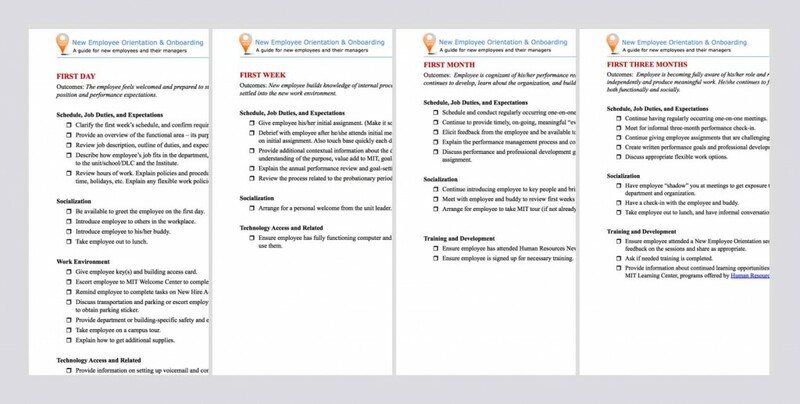 Smart companies break out onboarding into 30/60/90+ day segments and utilize a variety of techniques to grow their new hires. It’s an investment, but one that pays off with better retention, performance, and satisfaction. Good companies plan onboarding activities over time. These worksheets are from MIT’s new hire onboarding program. First run product experiences are like orientation. They’re a single event, often presented in a one-size-fits-all fashion, and achieve short term logistics like signup. While this “paperwork” is important, it’s not the same as onboarding. Onboarding guides people into new routines using a variety of techniques over time. When done well, the seam between onboarding and everyday user education is invisible. Researchers have spent countless hours trying to understand how long it takes people to establish routines. In “How are habits formed: Modelling habit formation in the real world” (Lally, van Jaarsveld, Potts, & Wardle, 2010), the habit forming process took an average of 66 days, but “…for one person it took just 18 days, and another did not get there in the 84 days, but was forecast to do so after as long as 254 days.” The numbers vary, but the gist is: It takes more than one run-through for folks to fall into a new routine. Many products have the goal of routine use. Thinking that every product can onboard every user in a single day is tragically optimistic. Even if our first run experience introduces key actions that we’d like repeated, our teachings will wither and die if not reinforced. That’s thanks to a phenomenon called the forgetting curve, discovered in the 1880s by German psychologist Herman Ebbinghaus. Ebbinghaus found that concepts need to be practiced to be retained. This is at the core of an educational concept called spaced repetition, which encourages students of any subject to distribute learning over time instead of cramming it in all at once. The Ebbinghaus forgetting curve suggests we’ll forget 2/3 of what we learn within the first day of exposure to it. People and products are not static. A site upgrade without preface may leave established users in the lurch. 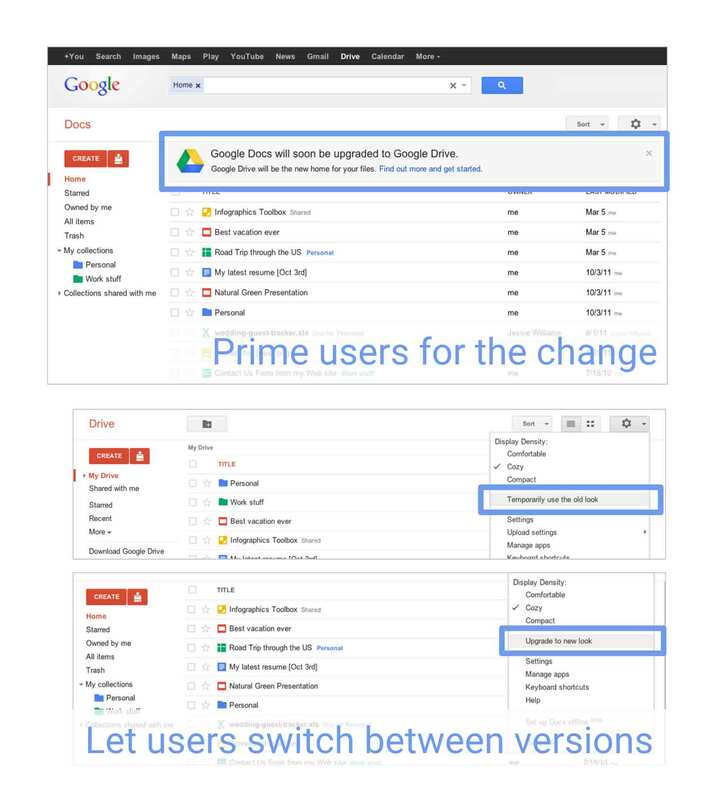 New features may be added that improve a user’s routine, if they could be guided to use them. So let’s stop thinking of onboarding as a first timer’s problem and instead consider how it can address multiple situations over long-term use. The following provides a list of situations, throughout the customer journey, when onboarding tactics can be useful. This includes the first run experience but stretches at least over the subsequent 7-30 days. The new user has come to your site/app/product in a quest to solve a problem, to meet a goal. Sometimes they’ve come to your product simply to explore, and other times they may be driven by a specific mission. That’s a long list of jobs, and insurmountable if we only gave onboarding the first run experience in which to complete them. Recent research from Android mobile apps, for example, suggests the most critical onboarding period is actually between days 3-7, not first use. So if we give onboarding a wider window of time in which to do its work, it can do it more effectively. Let’s see how the website of Lumosity, a brain-training service, leverages this extended timeframe to familiarize, convert, and continue engaging their new users. Lumosity starts out by learning about the new user, asking questions that invite personal reflection and teach the product about the customer. 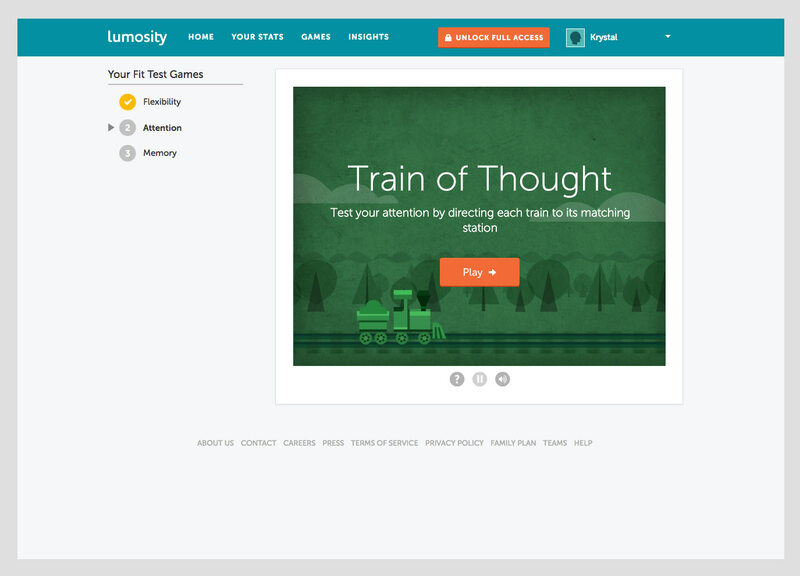 Lumosity then begins familiarizing the user with its technique of training their mental skills through games, by immediately offering them three games to try. After each game is completed, Lumosity reinforces the skill trained and offers teaser information about their subscription service–but they remain focus on leading users through the rest of the gameplan instead of to subscription. 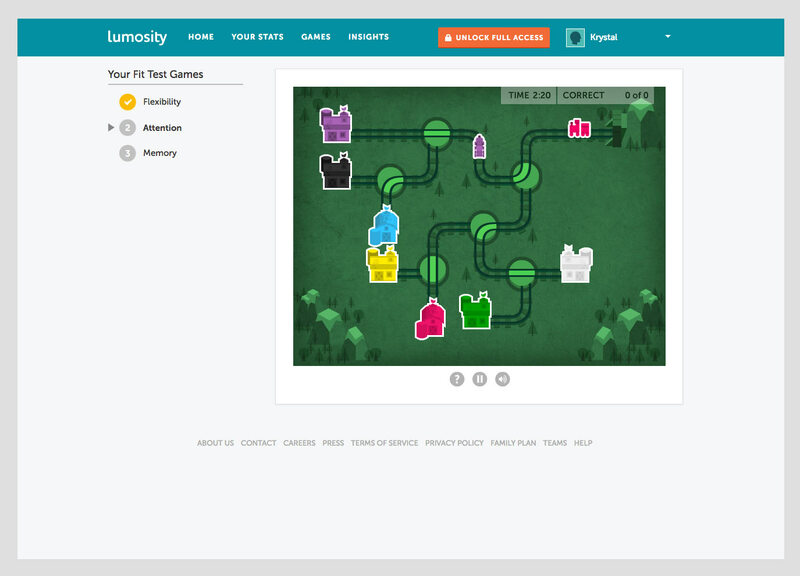 After all games are complete, then Lumosity expands with more details about their subscription service. But, they’ve rightfully planned for users to not be ready to subscribe at this point. 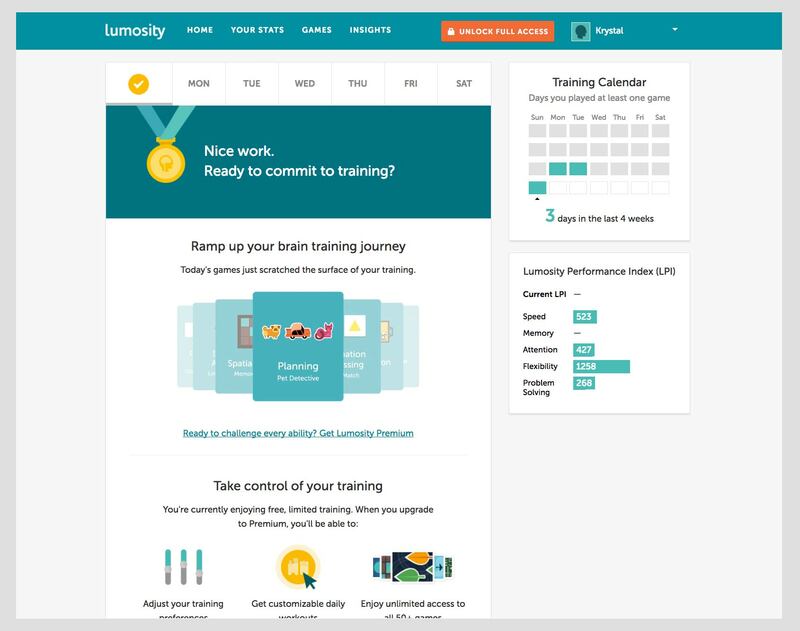 If the user didn’t subscribe after the first session, Lumosity sends an email the next day recapping the prior day’s results, and suggesting the user engage in the next day’s training. Upon completing subsequent days of training without subscribing, Lumosity keeps adjusting the content of its recap screens to provide various details about the benefits of subscribing. Even after subscribing, Lumosity doesn’t stop onboarding tactics. Right after the subscription is processed, the site guides the user to playing a few of the new games that they’ve unlocked. And even days after subscribing, Lumosity considers guiding the user to repeat engagement by showing other things that can be unlocked with daily training. As a person moves from newbie status to someone more knowledgeable, they start establishing a routine. But learning is not done. Products and people are constantly growing. There are plenty of opportunities to enhance the experience of a maturing user by introducing them to new features, or facilitating their discovery of existing ones. We can use what we already know about an existing user to onboard them to these opportunities. 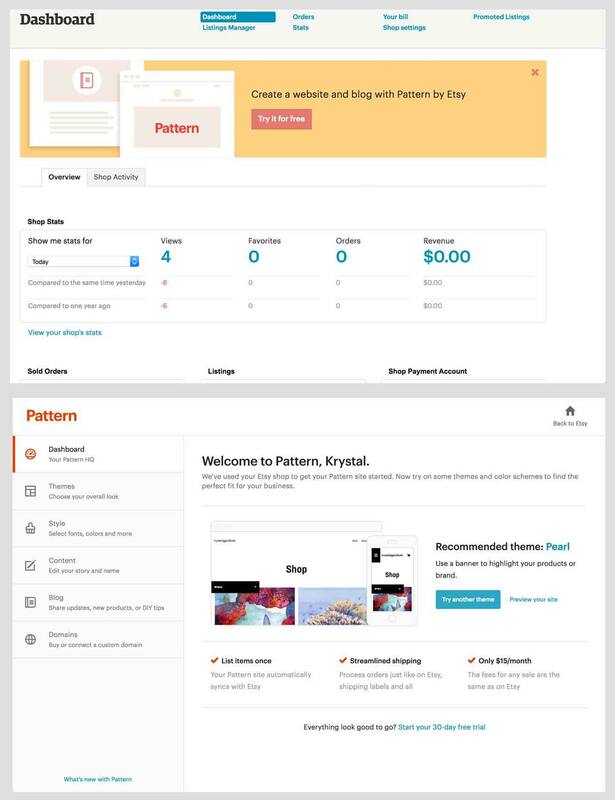 Etsy recently added a feature for existing shop owners, called Pattern, which allows sellers to create branded versions of their shops. The feature requires its own mini-onboarding flow to introduce existing users to creating shop layouts. 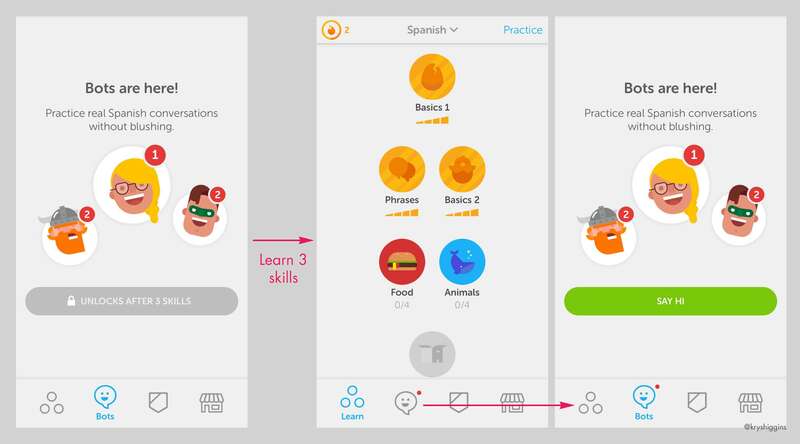 After a user has completed 3 lessons in Duolingo’s language learning app, it reveals a chatbot feature and onboards them to the new experience. Occasionally a product may be so completely redesigned that core workflows are altered (such as an operating system update to a phone or computer). Onboarding tactics are necessary to guide existing users through this change, much like how an employee at a company would want guidance after a large reorg. Finally, there are times when a user has returned to a product after a period of non-use. Perhaps the lapse is part of the natural usage cycle of the product, like how most people only visit a tax preparation website once a year. Or perhaps the user left because your experience wasn’t compelling, and is coaxed back by a re-engagement promotion. Many teams call onboarding complete once you’ve designed a tutorial or introductory slideshow. But when you limit onboarding to first run, you shortchange users that could benefit from similar guidance at other times in their experience. Instead, extend your initial onboarding philosophy and techniques to other moments in the customer journey like continued discovery, major redesigns, and returning from a lapse. To take the next steps to designing onboarding as part of a long-term approach to guidance, check out my next post on designing for longer-term guidance. When you design onboarding for the long run, it carries people through to retention and engagement.